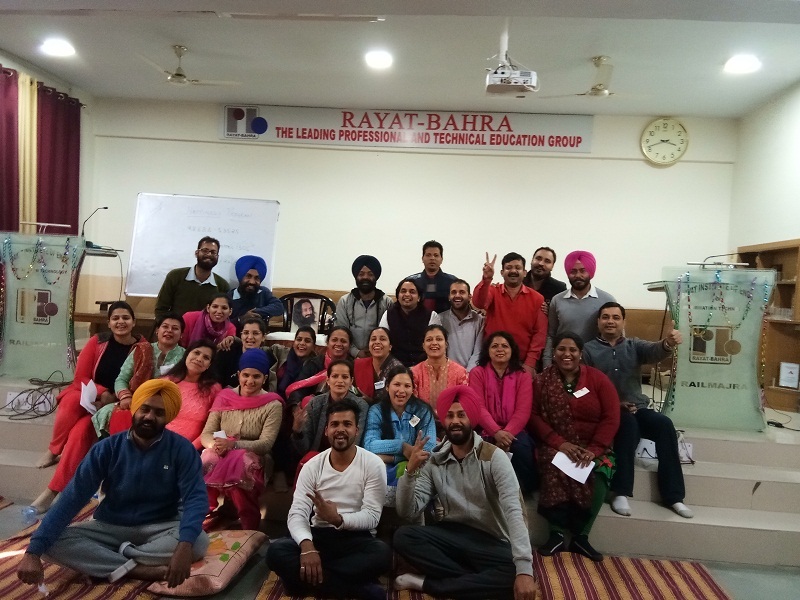 3 Days Happiness Workshop for Capacity Building Held at Rayat-Bahra, Ropar Campus. An Intensive 3 days Happiness workshop for Capacity Building was conducted at Rayat-Bahra Group of Institutions , Rupnagar in which around 50 faculty members from Engineering , Management , Pharmacy , Law and Polytechnic streams participated in the workshop . The workshop was organized by Art of Living Organization. Prof. (Dr.) Suresh Seth, Campus Director inaugurated the workshop. Dr. Suresh Seth told the faculty members that polluted environment, personal problems and work pressure take a toll on our body and mind. The Art of Living has come up with a holistic and integrated workshop called the Health and Happiness which provide unique tools and techniques which help combat stress accumulated in our daily, modern life. Prof. (Dr.) Ajay Goyal, Joint Campus Director said through Yoga asanas, breathing techniques and meditation taught in this workshop one feels light, energetic and enthusiastic to take on life! Er. Santosh Kumar was the trainer from Art of Living organization. Participants were introduced with Sudarshan Kriya, a rhythmic breathing technique for Stress Free Mind and a healthy body. The faculties experienced the increased level of calmness, happiness and enthusiasm among themselves. The Workshop Instructor Mr Santosh Sharma facilitated the members with Pranayama, Yoga, Games, and various interactive processes to bring out the knowledge that leads to Happy Living with effective Work-Life Balance. The program concluded with a happy note by the faculty members.